(Octavius Outpost) Dorator Technologies R&D has announced its new manufacturing and distribution strategy in the wake of the recent acquisition the manufacturing rights for several pieces of TRI Corp equipment. According to Dorator, the Drop Tank test facility is now operational. Other manufacturing changes should be moving forward over the next two weeks. TRI Corporation has agreed to sell all rights to its non-M.O.D.x. equipment lines to Dorator Technologies R&D effective today. This includes the DropTank refueling system, NightWatchman radar, TRIC-1 capacitor, TRIP-1 power plant, Vector engine and Warden shield. The sale includes the intellectual property, manufacturing rights, certain manufacturing equipment and current unsold inventory. Dorator will be coming up with a manufacturing and distribution strategy for its new equipment lines over the next 30 days. Although the sale price was not part of the release, sources have indicated that it was approximately 4.2 billion credits. It is also believed that Sorian Bancorp provided significant financing for the purchase. (UUNN HQ) Postern Associates (TRISE: PASS) announced today that it is in negotiations with Sorian Bank to acquire the patents, intellectual property and some physical assets of Annihilitech, which abruptly ceased operations in May of this year after accounting irregularities were identified (CFO Markos Theran is still a fugitive). When it closed its doors, Annihilitech was only manufacturing two items: the Senator long-range mortar and the Featherfire ion cannon, but over the years, Annihilitech developed some of the most destructive and powerful weapons known since The Great Collapse — among them the now-outlawed “Imperializer,” which reportedly ruptured atomic structures with high powered gravitrons. Much of Annihilitech’s weapons R&D was done under contract to other corporations like Particle Systems, Inc. and Aristio Conglomerated. It is unclear whether Postern intends to restart production of any Annihiltech equipment, or is simply looking to invest in the IP. (UUNN HQ) Aristio Conglomerated announced today that, effective immediately, it is shutting down production of its unique Graviton Displacer weapon — the Thief. 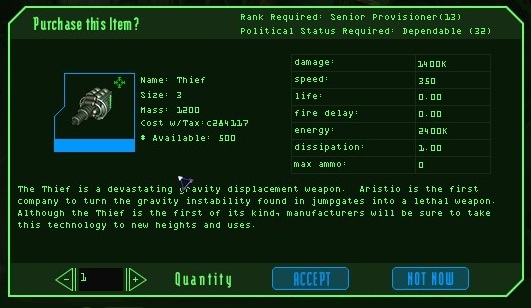 Because of lack of sales, Aristio Conglomerated is shutting down the production of this very-unique weapon. We’re sure there will be plenty of inventory available in markets across space to satisfy the need for this weapon for a very long time. We will also be focusing all production of the very-popular Spitfire ion weapon to our Tripoint manufacturing facility in order to gain production efficiencies there. (Octavius Outpost) Three months after accounting irregularities were uncovered, Annilitech has announced that is is ceasing all operations effective immediately. In addition, an arrest warrant has been issued for former CFO Markos Theran. Additional details will be provided as available. Although we will not refute the basic premise raised by Mr. Adiar — that there may very well be a cause/effect relationship between current surge in sentient Conflux activity and the extensive Conflux-hunt operation held two weeks ago — we believe that the way in which his message was delivered was not ideal. For that we will apologize. But we will very clearly point out that Mr. Adiar neither stated nor intended any disrespect to pilot samwise, in whose honor the conflux-hunt was held. Any contention otherwise is without substance or merit.